By Costa Maragos Posted: March 14, 2017 6:00 a.m.
Few life events bring friends and family closer together than the health scare of a loved one. Need an example? Look no further than the coming together of U of R theatre students and theatre alumni, performing in the upcoming play Bad Blood. It’s at the University Theatre March 15 – 19. Written and directed by Joey Tremblay, Bad Blood is “a gothic retelling of (Joey’s) harrowing experience with the Saskatchewan healthcare system. One part horror story and one part stand-up comedy, Bad Blood is a thrilling roller coaster ride through the many emotions of patienthood,” says the promotional material. Tremblay’s near-death experience will now see the light of day on stage. 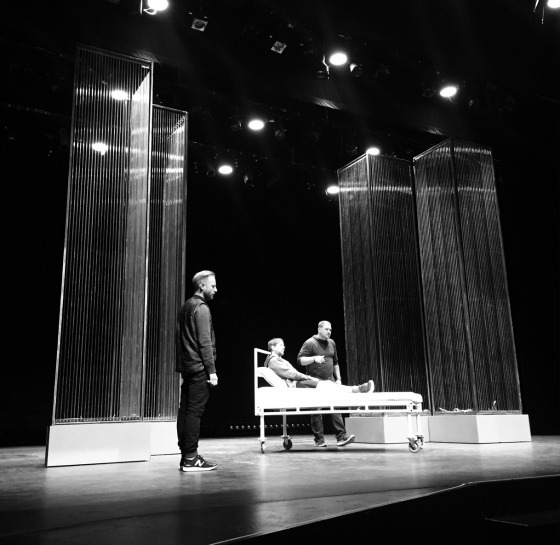 “This is not a critique of the health care system but an examination of these institutions’ relationships to empathy and healing,” says Tremblay, who is artistic director of Curtain Razors Theatre in Regina and a Distinguished Alumni of the U of R’s Theatre Department. Curtain Razors Theatre is collaborating with the Theatre Department of the Faculty of Media, Art, and Performance. But the collaboration doesn’t end there. Professional actors from Regina, Vancouver and Toronto, who are all alumni from the Theatre Department, are performing in Bad Blood. They are Amy Matysio, Jaydon Pfeiffer, Kenn McLeod, Kris Alvarez, Avianna Hudym, Tyler Toppings, Adam Milne and Andrew Valdez. They’re rehearsing with current theatre students of the U of R. It’s the first time a theatre production will involve this many alumni, mentoring recent grads and current students.